NOTE: Apologies for the lateness of this week’s post. It was written up, but then not posted immediately. Opal users can reach their weekly travel reward for $13.86 in under 30 minutes on Tuesdays if they have made 2 journeys on the previous Monday. 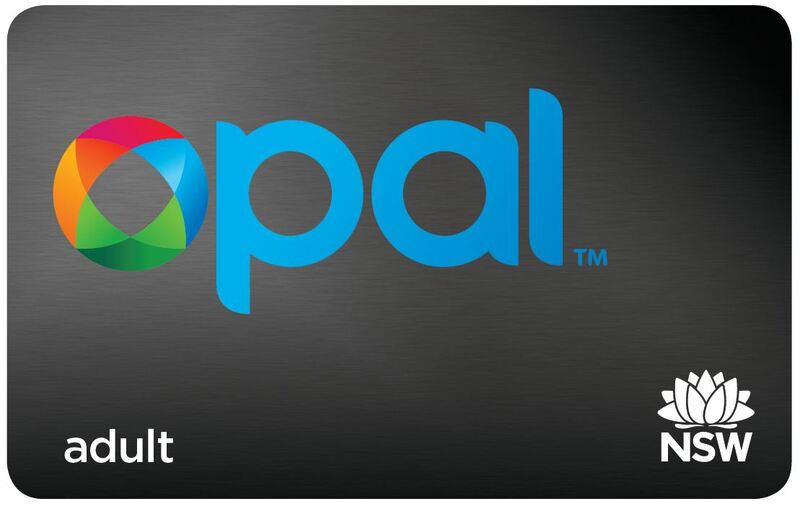 The “hack”, as it has been dubbed by the Opal Card App developers who discovered it, comes less than 3 months after the Transport Minister Gladys Berejiklian encouraged the public to seek ways of cutting their fare costs using their Opal card. The method requires customers to have already made 2 journeys on a previous day, due to the $15 daily cap. Customers must also travel during off-peak (outside of (7:00AM-9:00AM and 4:00PM-6:30PM) in order to receive the off-peak discount. It also makes use of the fact that Macdonaldtown Station and Erskineville Stations, the two stations that are the closest on the network, are only 350m apart. 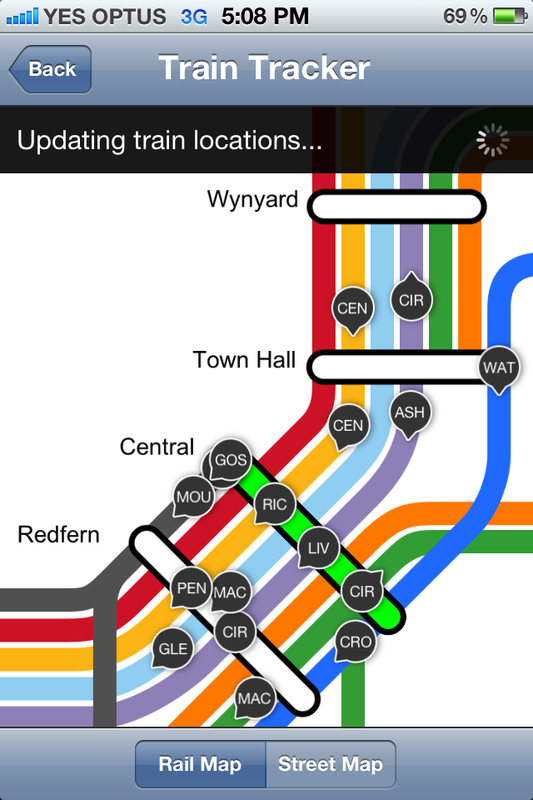 By tapping on at one and tapping off at the other, customers simulate catching a train and making 1 trip. By returning to the original station and tapping on again, a new trip is initiated. However, these 2 trips do not appear to be linked, thus making them independent journeys for the purpose of reaching the weekly travel reward. Normally customers must wait 60 minutes between tapping off and tapping back on in order for trips not to be linked and thus count as 2 separate journeys. The 2 stations must also be ungated, ruling out any CBD stations as well as major suburban stations. The NSW Government is set to trial pedestrian countdown timers at six intersections in Sydney to determine if the timers help improve safety for pedestrians. A yellow countdown timer, displaying the number of seconds left for pedestrians to cross the road, will replace the red flashing “don’t walk” signal. Real time locations for ferries and light rail is being introduced to transport apps, in addition to the existing real time vehicle information previously available for buses and trains. Real time data will be available on six transport apps: NextThere, TripView, TransitTimes+, TripGo, Triptastic, and Arrivo Sydney. The NSW Government is planning a second Harbour road crossing, linking the Balmain peninsula to the M2 at Lane Cove. The plans, reported by the Sydney Morning Herald and yet to be officially announced, are reportedly contingent on the 99 year lease of the NSW electricity distribution network. It will link up to the Northern extension of WestConnex, which will link up WestConnex to the Anzac Bridge. Plans for 60,000 new apartments to be built along the Parramatta Road corridor are set to be released by the NSW Government. One quarter of the new homes would be built in Granville, while a third would be built in Homebush. 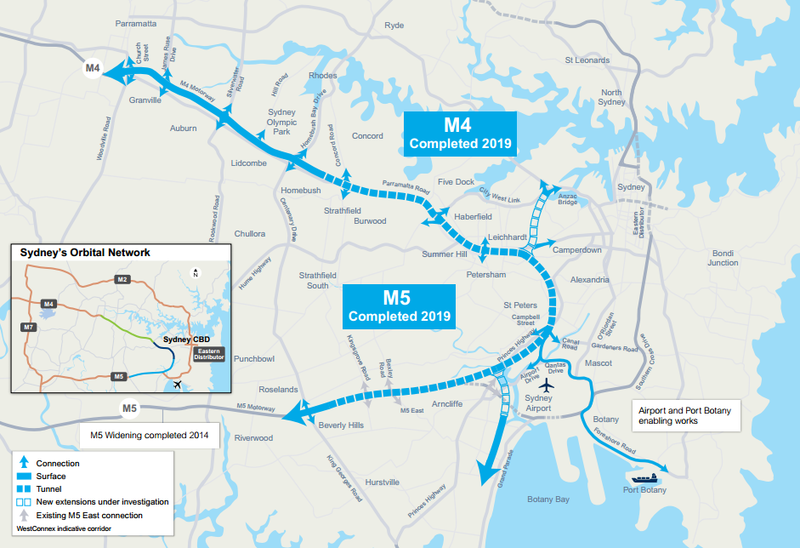 The plan includes improved bus connections between Burwood and the city, set to coincide with the completion of the M4 East portion of WestConnex parallel to Parramatta Road. Though the existing M4 is set to be widened between Parramatta and Concord, no details have been announced about any public transport improvements in this part of Parramatta Road. Over two thirds of the 60,000 apartments are to be built in this Western portion of Parramatta Road. This follows a push by the opposition for these plans to be made public immediately, rather than in 2015. The NSW Government is considering building a rail line via either Waterloo or Sydney University as part of its new Sydney Rapid Transit network according to a Sydney Morning Herald report. 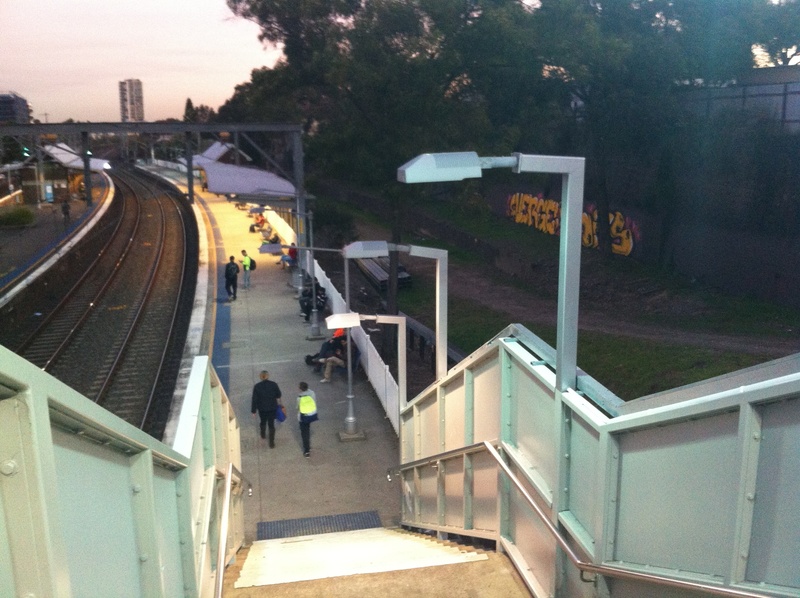 The line will connect to the currently under construction North West Rail Link via a Second Harbour Crossing at its Northern end near Central Station and to the Bankstown Line at its Southern end near Sydenham Station. 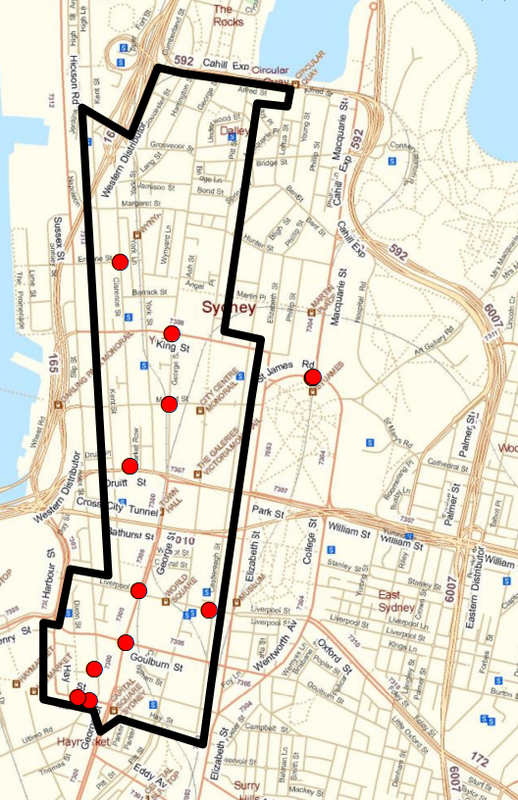 Transport for NSW is believed to prefer a Sydney University alignment, while Urban Growth NSW, a government urban development agency, is believed to prefer a Waterloo alignment to support new developments in the area. An alignment also exists between Sydenham and Erskineville at add an extra pair of tracks and new platforms at both Erskineville and St Peters Stations. It is unclear whether this surface alignment will be used or if the new line will run entirely underground through to Sydenham. The Commonwealth Bank is understood to be in talks with the Government to develop the ability to use credit or debit cards to pay for fares instead of Opal Cards. The Opal system was designed with the technical capability to use any contactless credit or debit card (i.e. anything able to use Paywave or PayPass), as well as Opal cards in order to pay a fare. London’s Oyster Card, which is based on the same technology as the Opal Card, has already introduced such a system; meanwhile the Commonwealth Bank was one member of the consortium involved in the design and rollout of Opal. Sydney Trains customers will soon be able to work out how full trains and station car parks are on their smart phones if CEO Howard Collins has his way. Mr Collins explained “we know on a Waratah train how many people are in each carriage by how much it weighs” and that this information can be passed on to customers to more evenly spread customers on trains. Waratah trains account for about 40% of the Sydney Trains fleet. Mr Collins also hoped that similar information could be provided for car parks at train stations. Regular users of the airport stations will pay no more than $21 a week under a $10m deal when using their Opal cards. Previously those travelling to and from the airport stations on a regular basis, usually airport workers, paid a $12.60 access fee each time they entered or exited one of the two airport stations. However, customers purchasing a weekly ticket would pay an access fee of only $21 for the whole week, on top of the regular fare. This concession did not exist for Opal users, but now their access fee will also be capped at $21 if using Opal. This was seen as necessary given the retirement of weekly train tickets starting from 1 September. The Government will pay the private operator of the airport line a one off $10m payment as part of the deal. More than half the NSW fleet of buses will be Opal enabled, with 2,890 buses accepting Opal cards from 26 August. NSW has around 5,000 buses in its public transport fleet. A Registration of Interest for the Maldon to Dombarton freight railway line has been approved to see if there is private interest in building the $667m line. The line would complete the missing link that would connect Wollongong and Port Kembla to the Southern Sydney Freight Line running through Southwest Sydney. This could remove or at least reduce the number of freight trains using the T4 Line through Sutherland and Hurstville, reducing their impacts on passengers trains on that line. The purpose of this post is to provide some information on the history of the Opal rollout in Sydney since its introduction and to speculate on its future over the coming 12 months. It does not cover anything before Opal was introduced in December of 2012, but for those who are interested then the post Comparing Opal to Myki and TCard is well worth a read. For the purpose of clarity, some things have been simplified, for example only the rollout within Sydney is covered and when Opal was extended to multiple lines/routes in a short period of time they have been lumped together. Rollout information was gathered from Transport for NSW Media releases. Opal was introduced on 7 December 2012 on the Neutral Bay Ferry, with 200 people signing up for the initial trial. By 25 March 2013, 550 Opal cards had been registered. It was later expanded to include the Manly Ferry on 8 April 2013, and finally all ferries by the 30 August 2013. However, take-up of Opal cards did not begin to gain traction until the rail network begun to be Opal enabled. The City Circle and T4 Line to Bondi Junction were the first to become Opal enabled on 14 June 2013. This was later expanded to Chatswood on 30 September 2013; then along T1 to the Central Coast via Strathfield, Macquarie Park, and Gordon on 31 January 2014; to Emu Plains a month later on 28 February 2014; and finally the entire Sydney Trains network the subsequent month on 28 March 2014. This was the moment that Opal take-up rates began to take off. In its first full year (2013), about 38,000 Opal cards had been registered. By 28 March 2014, just 3 months later, this had risen to 150,000 and by 23 June 2014 it had more than doubled to 340,000. However, this was slower than Transport for NSW had projected, with leaked documents showing that it had expected to reach the 150,000 figure by mid-February, at which point the actual figure was only 80,195. The first bus route to be Opal enabled was the 594/594H route on 30 September 2013. This is a long route that goes into the Sydney CBD, but is also quite lightly patronised, making it a good first choice to test out Opal. It was soon joined by the more heavily patronised 333 route on 2 December 2013, then by routes serviced by buses from the Kuring-gai depot (14 April 2014), Waverly depot (28 April 2014), Forest Coach Lines (10 June 2014), and Hillsbus (30 June 2014). Buses are the first mode of transport to have mobile Opal readers installed. Trains and ferries have Opal readers installed at stations and wharves which have fixed line connections, whereas the readers on buses are on the actual vehicles and transmit travel information via the mobile network. This means information is updated quite promptly compared to other smartcards, such as Melbourne’s Myki where Myki readers on trams and buses do not transmit their information until they reach a wifi spot back at the depot. In 2011, Sydney had 443,000 bus users, 366,000 train users, and 27,000 ferry users each day (Source: Bureau of Transport Statistics, Public Transport Users in Sydney, p. 1). Opal has now been rolled out to the entire train and ferry network, and only a small part of the bus network, which suggests a captive market of just under 400,000 daily users. 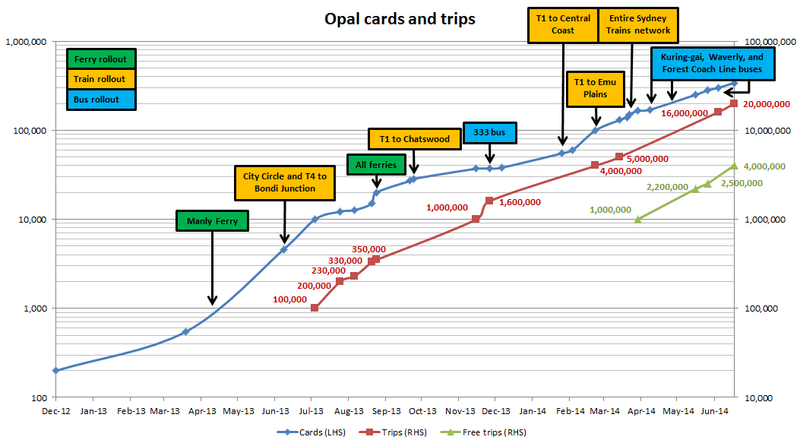 As of June 2014, the take-up of Opal cards reached 300,000. Not all holders of Opal cards would be daily users of the transport network, which suggests that there are over 100,000 users that have not yet taken up an Opal card. This is likely due to a combination of a lack of awareness, concession holders and seniors whose Opal card have yet to be released, and a fare system that makes some users worse off under Opal compared to traditional magnetic stripe tickets. The issue of awareness is likely to take some time to flow through the system while concession and senior Opal cards is discussed at the end of this post. The stumbling block in terms of fares for the take up of Opal is that there are 3 users who were worse off under Opal: ferry passengers, periodical ticket holders, and multimodal travellers. Ferry passengers: When myZone was introduced in 2010, the new myMulti tickets gave unlimited ferry travel. This meant that a myMulti1 was actually cheaper for a regular ferry user than a myFerry Travel Ten. Opal fares were cheaper than the Travel Ten, but still more expensive than the myMulti, leading to a very low usage of Opal by ferry users (as low as 5% at one point). The Government responded by removing all ferries from the $46 myMulti1, and removing longer distance ferries such as the Manly ferry from the $54 myMulti2. The backlash from commuters led to a discount being offered, where ferry users were given a $52 weekly cap, rather than the normal $60 weekly cap, until 29 June 2014. Periodical ticket holders: Shortly after the 2011 NSW election, the Government announced a 9% discounts for periodical tickets: monthlies, quarterlies, and yearlies. The purpose was to encourage pre-payment and reduce waiting times to obtain tickets. However, this also meant that these tickets tend to provide a bigger discount than Opal can, and switching to Opal can mean paying more. Even factoring in days lost to time off for holidays/being sick, it is still generally cheaper to go with a periodical ticket rather than Opal largely due to the 9% discount. This appears to be the thinking behind the retirement of periodical tickets from 1 September 2014 – it will force public transport users (train users in particular) to make the switch to Opal by making it the de facto cheapest option. Multimodal travellers: Arguably the biggest drawback of Opal is its lack of integrated fares. While it is an integrated ticket – the only ticket a public transport user needs, it lacks fully integrated fares – the same fare from Point A to Point B regardless of which or how many modes of transport are used. To it’s credit, Opal has provided integrated fares within modes for the first time – someone catching two buses sequentially will be charged only a single fare rather than two. But continuing to charge a separate fare for each trip made on a different mode means many users will pay extra on Opal compared to a myMulti ticket. The future of this issue is covered further towards the end of this post, and has been covered in quite some detail by David Caldwell at his blog (well worth reading for some detailed background information). Having to install Opal readers on each bus, generally progressing depot by depot, means the rollout for buses is much less predictable from a user perspective than the ferry or train rollout was. One bus is not necessarily assigned permanently to one specific route, and a bus route is often serviced by multiple depots. 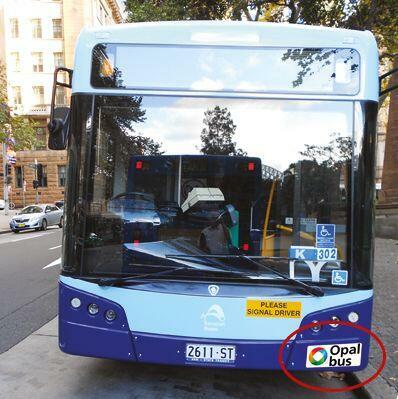 So unlike with trains and ferries, where users of particular stations and wharves began to be able to use their Opal cards, in the case of buses an Opal card can be used if that particular bus is Opal enabled (as shown by the ‘Opal Bus’ sticker on the bottom right of the bus). As a result, the weekly NSW Government Gazette often indicates that Opal can be used on more routes than have been announced by Transport for NSW. This is because the former includes all routes on which any bus may be Opal enabled, while the latter includes all routes on which all buses are Opal enabled. The bus rollout is scheduled to be completed by the end of 2014. The rollout of Opal to light rail is currently scheduled for 2015, with the rest of the transport network set to be completed by the end of 2014. This coincided with announcements that new trams would be delivered during 2014 to cater for the Inner West Light Rail extension to Dulwich Hill and the increased demand that it created. It suggested that Opal readers would be installed on the trams themselves and, with the original Variotrams almost 20 years old, speculation was that readers would only be installed on the new trams. This appeared to explain why Opal would not be available on trams until 2015. However, poles for Opal readers have been spotted at multiple tram stops, which suggests that Opal readers will be installed at the tram stops themselves. This may not preclude them from being installed on the vehicles too, one possibility would be that only the busy stops have Opal readers installed. But it does raise the probability of having off-vehicle Opal readers. Opal cards for Seniors will arrive later in 2014. Already buses have stopped selling Pensioner Excursion tickets, requiring pensioners to pre-purchase their tickets. Supporters of the move argue that pensioners could just buy 2 tickets, keeping a spare for getting the bus in cases where no retailer is available nearby, and then purchase a replacement ticket for the next day while they are out; particularly given the change was announced months ago. Critics argue that the move is premature, given that Opal cards will become available for Seniors in a few months, and that this change should be delayed until they are made available. No specific timetable has been made for Concession Opal cards, though they are most likely going to be issued by the relevant educational institution like current concession cards are. Whether institutions are just given a stack of Opal cards to hand out, if they issue dual student card/Opal card hybrids, or something else is unknown. It appears that they will not be rolled out until the entire network is Opal enabled at the start of the next academic year. High school students between the ages of 16-18 will be able to use the Child Opal card. The retirement of yearly tickets on 1 September 2014 means that the earliest date for retiring all paper tickets is 1 September 2015. This is the stated end goal. Changes to ferry, train off peak, and periodical fares mean that Opal fares are now the cheaper option for those who currently use those ticket types; this will be a big incentive in pushing these people to adopting Opal. But there still remains one type of fare that often remains cheaper with paper tickets than with Opal: multimodal fares. This will prove to be the government’s biggest challenge. Transport advocates in Sydney have called for integrated multimodal fares for a long time, but governments have done little more than take baby steps in that direction. It’s not the Opal technology that is preventing this, but political will and a decision on who will bear any economic cost (the government or the travelling public). So far the government has announced that trams and buses will enjoy integrated fares, with users charged a single fare based on the origin and destination of their journey. This is to prevent fares from increasing on the CBD and South East Light Rail which will force bus users to interchange to complete their journey. The North West Rail Link too will require users to transfer from a bus to a train, with buses from North West Sydney to the CBD to be converted into feeder services for the new rail line. 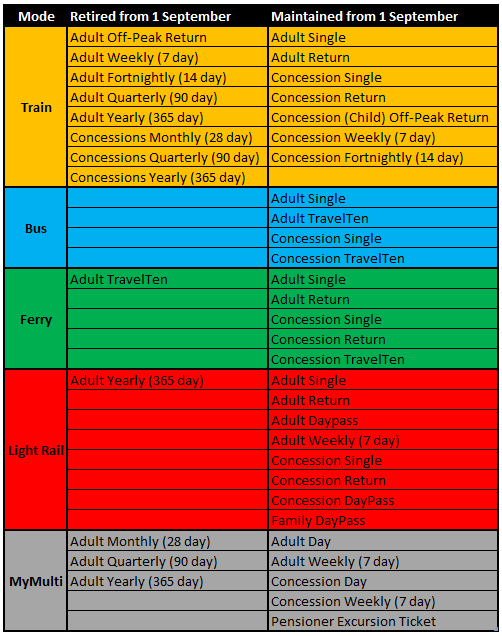 It would appear logical that a similar fare integration would also be extended to heavy rail too, which would then mean that the 97% of public transport journeys not using ferries would enjoy fare integration. Given the similar per km fare cost for bus and train trips at the moment, this would also be relatively easy to do.